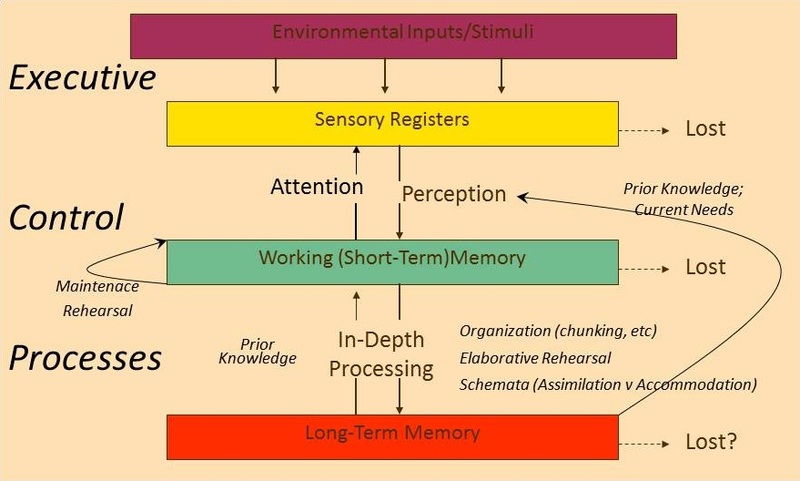 One model for memory is called the Information Processing Model or Dual Storage Model. Our senses receive stimuli. In the classroom students hear the teacher or a classmate talking, see the teacher’s notes or the note being passed to them, smell various things in class, taste their gum etc. The sensory register filters out most stimuli which means the teacher’s lesson is competing with all the other stimuli for attention. Most students are either visual or hands on learners yet the majority of instruction is conducted through auditory means. Information in a lesson that is meaningful or interesting is more likely to make it through the register. The information that makes it to the working memory is processed. Working memory has a limited capacity. Like a computer, if it is attempting to process a lot at one time it slows down. It is hard for some students to process a lot of auditory information if they are a visual learner so as they are attempting to process they may be missing other parts of instruction. This is why scaffolding and other strategies are important. They help reduce the amount of information the student has to process. The working memory also attempts to organize and make sense of the information -Gestalt Theory. Here are some examples. When I present the image below under “closure” and ask people what they see, the response is almost always “a triangle.” The really is no triangle there but the brain fills in the gaps. The brain wants to make the visual information meaningful. The information that makes it to long term memory is filed away. Effective learning means the stored information can be readily retrieved. Think of computer files or files in a file cabinet. I have a file for Gabriel’s IEPs so I can easily retrieve them. Contrast that with how a student may stuff his homework assignment into his bookbag but later cannot find it. Effective storage is enhanced when the information is organized and makes sense. This is helped by making the information meaningful or by addressing prior knowledge (e.g. new IEPs filed with old IEPs). Most if not all educational strategies would address some aspect of this model.